Radiant community improvements and continuing excellence in healthcare. Music in the Park series opening night at the Rancho Mirage Amphitheater draws a large crowd. If it’s true the best-laid plans are folly, then the City of Rancho Mirage is an exception to the rule. This forward-thinking community is proud to see many of its best-laid plans coming to fruition. There was really never any doubt they would. Years of prudent planning enable Rancho Mirage to enhance day-to-day life for its residents as well as the experience of countless visitors who flock to this splendid locale in the heart of the Coachella Valley. The emergence of a sensational new cultural venue within its boundaries has everyone abuzz while impressive improvements to a long established shopping destination are attracting new devotees daily. 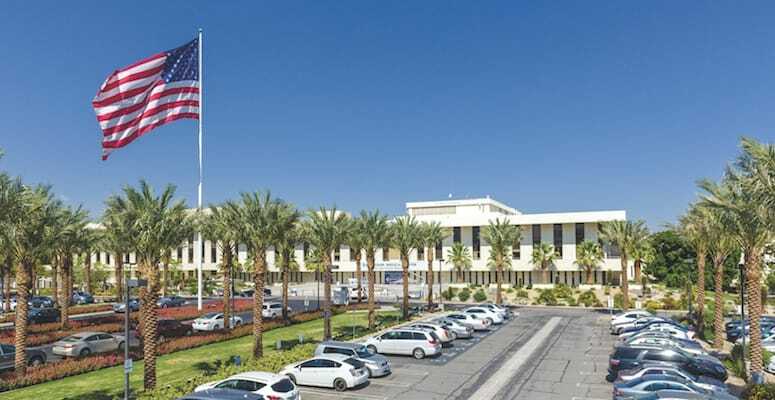 Not to be outdone, the renowned Eisenhower Medical Center situated on Bob Hope Drive in Rancho Mirage continues to cement its reputation as a world-class institution. Appreciative fans thrilled to hear the first strains of melody that emanated from Rancho Mirage’s handsome new amphitheater last November. 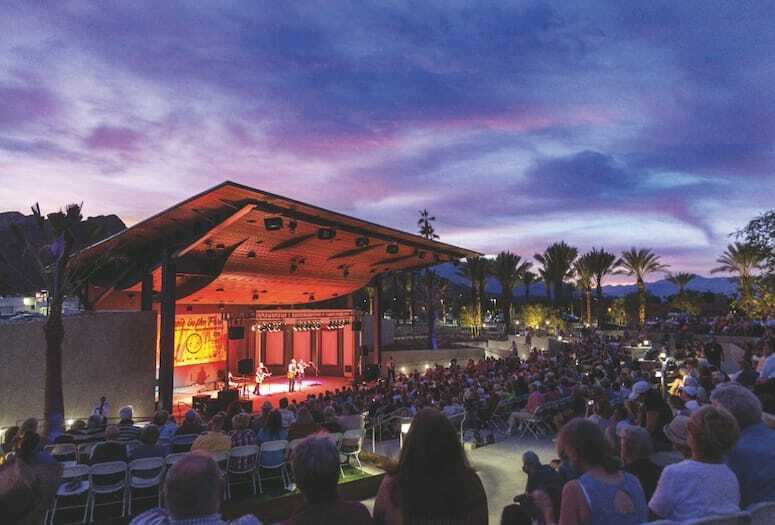 The much-anticipated and enthusiastically received musical venue was part of a 3-acre expansion at Rancho Mirage Community Park, the compact green space hugging the Whitewater Wash that was once one of the City’s best kept secrets. The secret may be out but there are no regrets as the City is extremely proud to pull the curtain back on this wonderful entertainment venue. Conceived for the community’s entertainment and pleasure, the amphitheater seats up to 1,000 guests and state-of-the-art sound and lighting equipment is incorporated into the architecturally impressive canopy that provides optimal acoustics and maximum shading for patrons. If last year’s attendance records to the inaugural Music in the Park series are any indication, the 2017 MITP Series will surely be one of the hottest happenings in town. Look for the Series to include a variety of talented artists and eclectic genres designed to suit all tastes, with both free and ticketed performances. 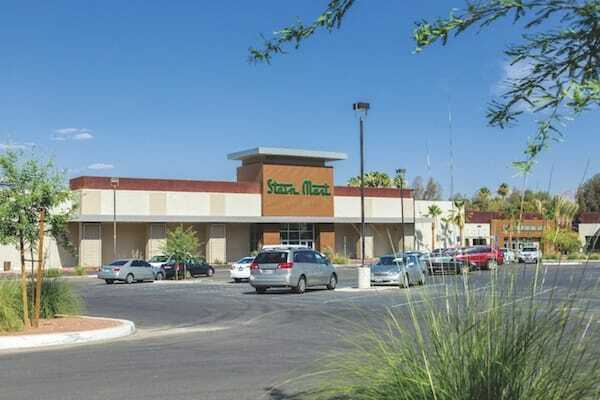 Residents and visitors who aren’t already familiar with the venerable Rancho Las Palmas Shopping Center at the northeast corner of Bob Hope Drive and Highway 111/Magnesia Falls would do well to take another look. There’s a good chance the sparkling new CVS/pharmacy at the forefront has already caught their eye — yet so much more lies within. As the Center wraps up a two-year remodel, it’s now easier than ever to access with an inviting entrance directly off Highway 111. Shoppers can drive right in and up to convenient service windows located at both the CVS and newly installed Starbucks. If they park and linger, plenty of exciting new retail opportunities beckon alongside all the comfortably established businesses and services which now dwell in slightly reconfigured spots. 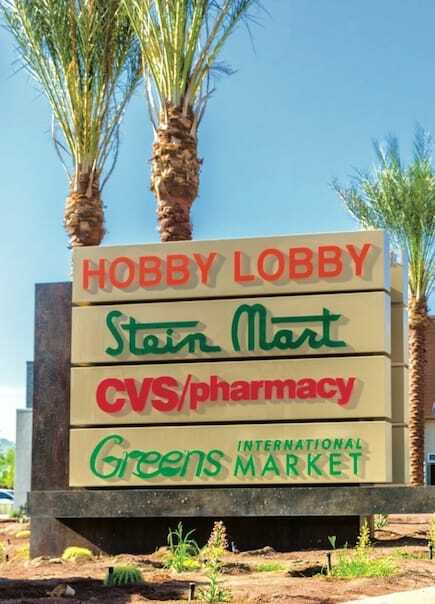 The newly completed Rancho Las Palmas Shopping Center, which houses the third Stein Mart in the valley, the spacious Hobby Lobby, CVS/pharmacy, Greens International Market, and a Starbucks drive-thru, too. The City is proud to have played an integral role in Rancho Las Palmas Shopping Center’s resurgence following the downturn it suffered at the beginning of this decade. It was essential to secure a developer who shared the same vision of what the shopping center could be in the wake of all it had been for a couple of decades since it first opened in 1978. One swing through and it’s obvious they’ve more than succeeded. Stein Mart, the popular boutique-style men’s and women’s department store is an undeniably solid presence. A slew of hobbyists are eagerly anticipating the soon-to-open Hobby Lobby. And Greens International Market, a family-owned grocery store, will be bustling with activity very soon. These days, there’s a celebratory air at the Rancho Las Palmas Shopping Center as those who’ve relied on it for years come to rediscover it afresh and countless new shoppers are drawn in. 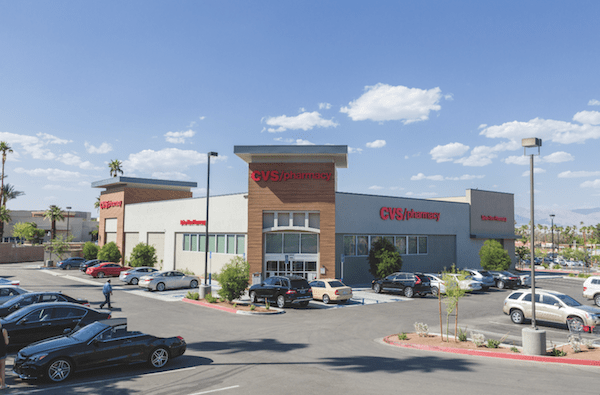 The Rancho Las Palmas Shopping Center showcases its new CVS/pharmacy with a 24-hour drive-thru pharmacy window for customer convenience, as well as the centrally located Stein Mart, between its Palm Springs and La Quinta locations. Fifty years have passed since initial seeds were sown for Eisenhower Medical Center, the renowned mid-valley hospital that graces Bob Hope Drive in Rancho Mirage today. To say the facility has blossomed would be a vast understatement. When U.S. News and World Report released its annual hospital rankings for 2016-17, Eisenhower Medical Center was ranked #1 in Riverside and San Bernardino Counties and #21 in California. The Center also attained a High Performance rating, the highest achievement level possible in all nine of the specific types of care for which hospitals are customarily analyzed. EMC gained the highest number of specialty recognitions in the following high-performing disciplines: Abdominal Aortic Aneurysm Repair, Aortic Valve Surgery, Chronic Obstructive Pulmonary Disease (COPD), Colon Cancer Surgery, Heart Bypass Surgery, Heart Failure, Hip Replacement, Knee Replacement, and Lung Cancer Surgery. Eisenhower Medical Center’s continual growth over the years is key to its formula for success. Centers of Excellence that have sprung up and represent the hospital’s specialized services include Smilow Heart Center, Lucy Curci Cancer Center, Eisenhower Neuroscience Institute, Eisenhower Desert Orthopedic Center and the CARF-accredited Inpatient Rehabilitation Center. The latter accreditation is a prestigious one from the national Commission on Accreditation of Rehabilitation Facilities that Eisenhower earned in record time. Eisenhower was also the first hospital in the Inland Empire to receive the Joint Commission’s Gold Seal of Approval® for stroke care and it was recently re-certified as a Primary Stroke Center, underscoring the hospital’s commitment to stroke patients. EMC further demonstrated its commitment to overall excellence when it became an accredited teaching hospital in 2013, as it is a widely known fact that teaching hospitals bring out the best in healthcare delivery. 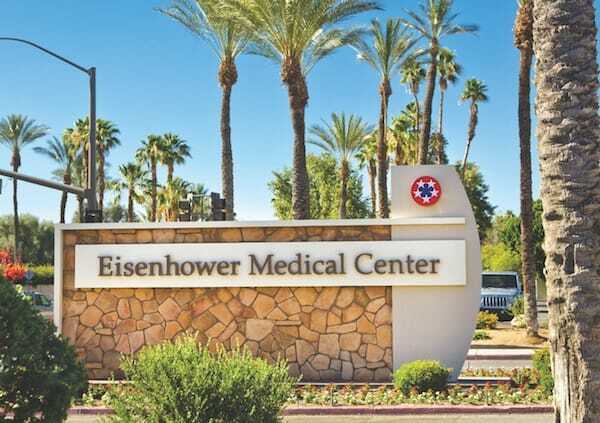 Eisenhower Medical Center was dedicated in 1971 and named in honor of President Dwight D. Eisenhower, who made the Coachella Valley a part-time home in his retirement years. For more than 40 years, Eisenhower Medical Center, the valley’s only not-for-profit hospital, continues to provide high-quality service and care for all residents of the valley. Elsewhere in the City, yet another acute care rehabilitation center is currently under construction. Vibra Rehabilitation Hospital of Rancho Mirage is set to open in late summer 2017 at the corner of Ramon and Da Vall. The 50-bed facility will provide services for patients suffering from multiple sclerosis, Parkinson’s, stroke, and spinal cord injuries. The hospital will also provide care for patients with amputations, arthritis, brain injuries, and orthopedic needs, including hip fractures, joint replacements, and osteoporosis. By virtue of its careful planning and patience, the City of Rancho Mirage continues to distinguish itself among Valley cities. A compelling new entertainment venue, a revitalized shopping center, and world-class medical facilities represent just a small fraction of what this fine City is all about. Part- and full-time residents as well as countless visitors either already know or quickly discover this to be true. They would also be right in assuming there are only more good things to come.